The warm spring breeze in New York City has us removing layers of coats and sweaters, reminding us that summer is right around the corner. Tis’ the season for teeny bikinis, short shorts and a whole lot more exposed skin. While some of us splurge on hair removal treatments at NYC’s top salons, not all of us can afford laser, wax and threading services on a weekly basis. Luckily, Nair products provide professional results at home for staying smooth all summer long – at a fraction of what you’d pay at a salon or spa. Growing up with olive skin and dark hair, I begged my mother to allow me to shave my legs in early middle school. I also prayed for a way to remove my “mustache” because I feared teasing from boys I had crushes on. Thankfully, my mother indulged me in my quest for hair removal and introduced me to Nair at this early age because she believed it was a safe and painless way for a young girl to gain hair-free confidence, without the embarrassing stubble of shaving. Years later, as a twenty-something New Yorker, I still swear by Nair’s products for easy and affordable at-home hair removal. 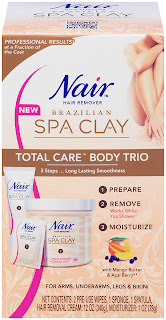 While Nair’s offerings over 15 years ago were dependable and reliable for my middle school self, the Nair Brazilian Spa Clay Total Care Body Trio and Face Trio are the newest depilatories to join the popular Brazilian Spa Clay Line inspired by the beauty secrets and hair removal expertise of Brazil that you’ve just got to get your hands on this summer. Each product is infused with mango butter and açai berry to moisturize and mineral-rich clay to purify the skin. Step 2: The second step is the depilatory. There’s no drying time, so you can apply the depilatory immediately after using the pre-balm. Step 3: After removing the depilatory product, apply the moisturizer, which is similar to a typical facial moisturizer. This will help neutralize the pH of the skin, bringing it back to the normal level. Step 2: Apply the depilatory, which is resistant to water through emollients similar to those found in waterproof sunscreens so it will resist runoff while you shower. Keep the area out of the direct stream of water. Step 3: After the hair is removed, apply soothing post-use gel with Aloe Vera for a perfect finish.